Very recently on 12 October, 2015 a report circulated by an US based Internet Blog ie. “Healthy Food House” with a title “Stop eating tilapia ASAP”. The report mentioned that there was evidence that tilapia, the third most consumed fish in America, is extremely harmful to American’s health, since the imported fish grown in China in bad farming practices. Similar report was also circulated earlier by another American Internet Blog ie. “Personal Advisory” titling as “Farm-raised tilapia is a health hazard”. It came to our notice that both of these two reports have similar misleading information mentioning that farm raised tilapia has i) High Dioxin levels; ii) Higher pesticides and antibiotics; iii) Low Omega-3 and to Omega-6 fatty acid ratios; iv) Cancer causing pollutants etc. But no other country(s) of the world yet reported like that tilapia is a bad fish. Interested readers may read more through the recent report of WorldFish published on 21 December, 2015 in “The Fish Site” titled as “Tilapia: A Nutritious, Environmentally Friendly Fish”. WorldFish reported as “The aquatic chicken, farmed tilapia is now a staple in many parts of the world. A healthy source of protein, micronutrients and essential fatty acids, tilapia is now the fourth most consumed fish in the US and it is farmed extensively in China, Egypt, Philippines, Indonesia, Thailand and Brazil among many other countries”. Recently a group of Egyptian scientists conducted a survey in collaboration with WorldFish and International Livestock Research Institute (ILRI) under a project entitled “Rapid Integrated Assessment of Nutrition and Health Risks Associated with Tilapia Value Chains in Egypt”. This study also revealed that “analysis of farmed tilapia samples for chemical pollutants (heavy metals and pesticides residues) revealed that, all tested elements were either non-detectable or within the maximum permissible limits (MPL)”. Similar findings also revealed for bacteriological and other analyses of their samples collected from farm-raised tilapia in Egypt. Although such type of study and survey have yet not been conducted here in Bangladesh, we hope, Bangladesh Fisheries Research Institute (BFRI) in collaboration with Department of Fisheries (DoF) WorldFish, Bangladesh and Bangladesh Tilapia Foundation (BTF) will come forward to carry out similar type of investigations. We, hope, these sort of study will proof that farm-raised tilapia is no more health hazard in Bangladesh like other parts Asia. 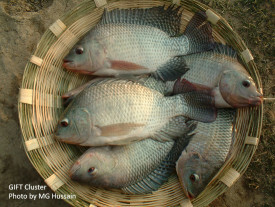 In fact, immediately after circulation of afore mentioned unrealistic information in the US based Internet Blog, a number local media and newspapers in Bangladesh played also very bad role of publishing such news without justifying it’s serious impact and consequence on the general consumers and whole tilapia aquaculture farming industry in the country. Presently, Bangladesh is among the top 10 leading tilapia producing countries in the world. And it is true and fact that tilapia value chains support the livelihoods of millions of rural and urban poor, for whom such value chains can act as pathways out of poverty in China, Egypt, Brazil, Bangladesh and many other tilapia producing countries in the world. So, on behalf of BTF, we like to protest against this propaganda and we wish to raise our voice along with other tilapia producing nations of Asia, Africa and Latin America that “Farm-raised Tilapia is not Health Hazard At All in Bangladesh and Elsewhere in the Globe”. Visited 2,153 times, 1 visits today | Have any fisheries relevant question?